There are a lot of things about James Blake that have changed. Then again, there are a lot of things about Blake that have stayed the same. Both the Blake of old and the Blake of new were on display in his 6-7(6), 6-4, 6-4, second-round loss to young, up-and-coming Aussie Matthew Ebden on Thursday afternoon. 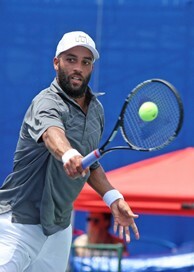 A tour veteran, Blake has had a strong 12-year career that has seen him reach the highest echelon in tennis, having reached three Grand Slam quarterfinals and a No. 4 world ranking. His experience and shot-making prowess that brought him to such heights were on full display in a highly entertaining first set today. Blake and Ebden held serve comfortably, going toe-to-toe with flashy forehands and great hands at the net. Blake’s running forehand and court speed were one of the best in the game when Blake was a Top 10 player, and Ebden felt its full force as Blake recaptured that youthful quick-step to pressure his opponent into errors to gain a first set lead. In the second set, however, Blake’s age and 12 years of grinding it out on the pro tour began to show through as he offered little resistance to Ebden’s excellent first serves and began to lose that quick-step of old. Blake appeared a little worn in his dark gray shirt, shaved head, and full beard, a stark contrast from the sleeveless, bright outfits, clean shaven face, and bouncing dreads that first carried him on the tour in 2001. Ebden seized the initiative when Blake’s forehands went wide and took the second 6-4. The experience and veteran’s knowledge of how to pace one’s self during a match was on display in the third set as Blake weathered a break of serve to break back, putting his energy into his service games and relaxing on the return to save energy for a final push at 4-all. But serving at 15-30, Blake lost his footing on the court trying to retrieve an Ebden backhand and appeared to wince upon standing. At the change of ends, Blake received treatment on his back, hoping to get enough treatment to continue strong. It was not meant to be, however, as Ebden continued to be aggressive on serve and Blake could only watch as the young Aussie’s shots blasted past a step ahead of his feet, with an unreturned forehand sending Ebden into the quarterfinals. For Blake, there was a lot of good to take from here, as he beat No. 6 seed Ryan Harrison in the first round for his first tour level match win of the year against six defeats. Having become recently engaged and welcoming his first child this year, at 32, Blake is developing his life after tennis. But after this year’s Atlanta Open he can hang his head high knowing that he still can compete, and compete well against the younger, higher ranked competition in the likes of Harrison and Ebden, showing the resolve and fight to bring together the Blake of old and the Blake of new and continue to be a force on the ATP Tour.